Save an extra CDN$ 21.83 (50%). Buy the Kindle Edition instead. The most comprehensive guide since the bestselling NightWatch from the top Internet site on the topic with over 87k Facebook followers. Start reading The Universe Today Ultimate Guide to Viewing the Cosmos on your Kindle in under a minute. "This guide has something for everyone with even the slightest interest in the skies above: easy-to-follow advice for finding the good stuff, fun activities to deepen your appreciation of cosmic wonders, key events to watch for when the skies are clear and lots of tales and trivia to muse over when they're not." 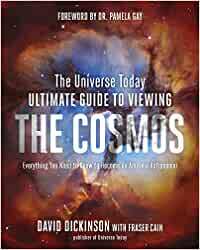 "The Universe Today Ultimate Guide to Viewing the Cosmos is a really useful guide for the enthusiastic astronomer. A brilliant introduction for amateur astronomers." "Even readers who already have a background in amateur astronomy will murmur 'ah hah' when they encounter the lovely diagrams in this book. This is the astronomy book that we've always wanted." David Dickinson is an Earth science teacher, freelance science writer, retired USAF veteran and backyard astronomer. He currently writes and ponders the universe as he travels the world with his wife. Fraser Cain is the publisher of Universe Today. Hes also the co-host of Astronomy Cast with Dr. Pamela Gay. He lives in Courtenay, British Columbia. Amazing book, superb quality and content. I highly recommend this to anyone interested in astronomy. 5.0 out of 5 starsAwesome! Conversation starter! This is an amazing coffee table book! Before this book was published I recommended Turn Left at Orion and Nightwatch to new stargazers. I can now add a third suggestion. 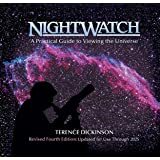 Note that this guide is not a book you will take into the field with your telescope, Orion and Nightwatch are better for that. But this Ultimate Guide is put together by people who have been watching and photographing the night sky for decades. They lay out the needs versus wants of equipment, explain how to stargaze and get the most out of your time and explain equipment well. A good starter book for someone looking to get into Astronomy. 5.0 out of 5 starsGorgeous and useful! First I have say this book is beautiful! From the clean colorful formatting to the gorgeous astrophotography. This is a great book for any Astro lover whether you are just starting out or are more experienced and want to also extend into astrophotography. The topics are well written and easy to understand. I’m still reading and learning from this book. I’ll refer to it again and again in the future. 5.0 out of 5 starsA gem of a book for Astro-Enthusiasts! Listen to Astronomy Cast. It's good for ya! I heard about this book from my weekly dose of fun, intelligent entertainment: Astronomy Cast!! Listening to Frasier Cain and Dr. Pamela Gay knowledgeably discuss such amazing topics about the bleeding edge of astrophysics and cosmology rekindled and stoked my desire to learn more about the cosmos. I found the biggest telescope that craigslist would sell, and bought this book! If you do nothing else for yourself this year, do yourself a solid and buy this book. Its about time you learned about what humans have been studying since literally the dawn of time. Seriously. Hit the buy button now. It will be on your doorstep tomorrow... and listen to Astonomy cast. Do it! 5.0 out of 5 starsAmazing, beautiful, and informative. Have read “Universe Today’’ for about a decade and listened to “Astronomy Cast’ since it’s inception. This is now the perfect companion blending my love of astronomy and photography. Even if you only have a passive fancy for either, this book will be a favorite for a long time. The pictures from the contributing armature Astro-photographers are amazing, and the read is engaging and informative. This is the perfect coffee table book so that all your friends and family can enjoy it as much as you will.